My friend, who is on the same dating website as me, recently joked that every time a date falls through or someone doesn’t write back to her, she just assumes that they are dead. What other reason could they have for bailing? Sometimes she’ll make up elaborate death scenarios for them, like how they slipped and fell into a vat of sulfuric acid while desperately trying to respond to her message. Or how after receiving her message and looking at her profile they decided they would offer themselves to her as a sacrifice. Online dating is a dangerous place, my friends. Several months ago I wrote a blog post about how I signed up for a dating website. I was optimistic and excited, and even met a girl that I quite liked. Well friends, like all sequels in what I’m hoping will be a trilogy, this is a much darker post than the original. Things are different now. I went out with the first girl I messaged with, and we were going out for a while before I got dumped. It was weird being dumped because, clearly, I’m a catch*. I am told on a daily basis that I am a handsome and special young man by a completely unbiased party**. So clearly the problem is not with me. Anyway, since then I have been practicing something I like to call “binge-dating.” I don’t date anyone for a while, and then I set myself up for three dates in the same week. It is an exhausting process that I don’t recommend to anyone. There have been a few highlights. My first date after the break up was with a girl who showed up drunk and, after I mentioned something about my grandfather, started crying about her dead grandmother. I felt bad at first, but she then told me that her grandmother had died many years before. She then stopped crying and had an intense, one-way conversation with me about how stars on reality television shows are much more intelligent than we give them credit for. Awesome. The date after that was with a girl who had been diagnosed with pneumonia earlier that day. She spent the entire date in a hysterical coughing fit. I’m pretty sure I saw blood. When I tried to tell her that we should reschedule because she might, oh I don’t know, die, she responded with “well we’re already here.” Good stuff. i saw you somewhere on this thing. you seem nice. say hi… Julie. ps are you a cop? Still don’t really understand that one. I never wrote her back, which I think I will regret on my deathbed. If anyone has any theories as to why she was asking me if I was a cop, I’d love to hear it. 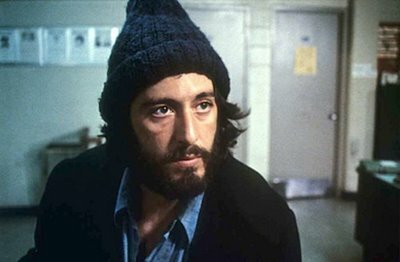 The only thing that I could think of is that with a gray beanie and a beard, I can sometimes vaguely resemble Serpico. And yet I date on. My more recent experiences resemble less a traditional Brontë sisters romance and more some sort of bizarre Kafka nightmare. Here’s to hoping that the third part of this trilogy of blog posts will take after The Return of the King, The Godfather Part III or Return of the Jedi. And by that I mean it will go on for way too long, I will have just been on a date with Sophia Coppola and my life will have been vastly improved by my new friends, the Ewoks. *27-year-old X-Files fan with love handles. Wanna go out sometime? Do you have any drugs on your person? It’s so hard to weed out the goons because it is so easy for people to misrepresent themselves on the online dating sites, and let’s face it, there are a lot of disingenuous weirdos out there. It’s awesome that you have found ways to deal with the trials and pitfalls with a bit of sardonic humor. When I used to do this (and I actually met my wonderful spouse who lived in a different city online but before I did, I had nothing but bad online dating experiences), I would try to justify all the bad dates by thinking about all the humorous stories I’d eventually have to tell at parties. Funnily, I can hardly remember the bad ones anymore. I hope you will stick to your standards and listen to your instincts, and eventually you just might make a perfect connection. The first date after the breakup sounds pretty wild. Was the reality-tv monologue totally spontaneous, unprompted? Thanks anon…that’s exactly how I’m trying to think about it. All just good stories for parties. It’s nice to hear that these sites work for some people though. Modesto Kid, I definitely did not prompt the reality tv monologue. I think I said about three words that whole date. She was a tornado of chaos, and literally went from crying to ranting to completely fall down drunk. Hilarious, Andrew. And come to think of it, you do kind of resemble a heavyset, redheaded Serpico. Online dating is fascinating. I tried it only once, and ended up having a first date on a Sunday night with a woman who turned out to be the ex of a woman I was meeting the very next night. I met them through the same dating website. Once we figured out that i was about to go on a date with her ex, the first woman had a bit of a meltdown: “Ask her why she dumped me! No, don’t! She’s really fabulous, I hope you two hit it off! No, I don’t!” and so on. The next night, when I told the second woman about the first, she was partly amused and partly freaked out. Second woman is RB, for those who don’t know. And first woman was right, she is fabulous. So, online dating worked for me! So so so funny. More dating posts, please? Perhaps you could have a date-of-the-week-type thing here on TGW? Or non-date-of-the-week stories. My best excuse for getting stood up was by a guy who was in the hospital because that morning in court a deranged litigant pulled a machete out of his briefcase and tried to cut my date’s head off. Of course no one told me, and I kept leaving pathetic messages on his voicemail all evening.